Ever since Prince Alwaleed bin Talalsaid of Saudi Arabia said that Bitcoin was the new Enron, I kept meaning to do a story comparing the two. From my perspective, they couldn’t be more different, but lets try to be as objective as possible when looking at the facts. Enron was born from the merger of Houston Natural Gas and InterNorth, a Nebraska pipeline company, in 1985. During the merger, Enron took on significant debt and needed a new business. CEO Ken Lay found a new idea for a Gas Bank, which they created in 1990 with the help of Jeff Skilling. This new business focused on creating Energy Markets and was successful in bringing Enron back to profitability. Until 1998, the business and stock performed within normal levels, and then began to see huge increases in stock value. The creation of Enron Online (EOL) in October 1999 and the signing of a Video-On-Demand deal with Blockbuster in July 2000 sent the stock soaring. Even though these businesses were not generating any revenue, the stock market was rewarding the stock price with the future potential they saw in Enron’s new internet and bandwidth market focuses. The company reaches an all-time high of $90.56 in August 2000. 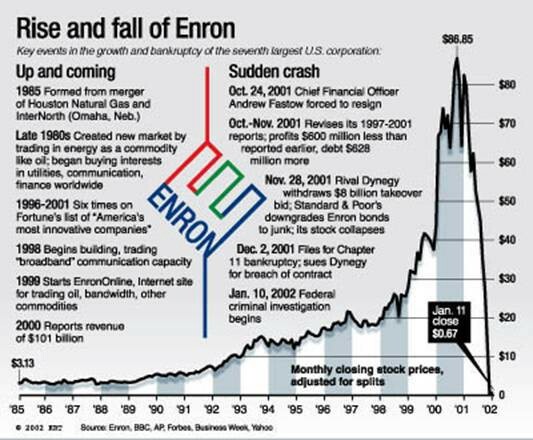 Enron’s stock increased from the start of the 1990s until year-end 1998 by 311%, only modestly higher than the average rate of growth in the Standard & Poor 500 index. However, the stock increased by 56% in 1999 and a further 87% in 2000, compared to a 20% increase and a 10% decrease for the index during the same years. An energy company, listed on the NYSE, and in what seemed like constant compliance and scrutiny of the SEC, lied about it’s profits during the dot-com bull run and duped most of Wall Street. Bitcoin is a decentralized electronic cash system created in 2008 by an unknown contributor going by the name “Satoshi Nakamoto”. Referred to commonly as “Gold 2.0”, the innovation is in verifiable scarcity; the clever algorithm ensures that there will never be more than 21 million coins, or the entire system will be worthless, due to lack of trust. Bitcoin and it’s price stay in relative obscurity, going from valueless to $0.01 in 2010 (helped by the now famous Bitcoin Pizza Order). The opensource project grows rapidly, with a developer community working for no compensation and mining centers popping up all over the world, most notably in China, where energy costs are low. In 2017, the cryptocurrency market starts an epic bullrun, with new coins forming everyday thanks to a new platform and cryptocurrency called Ethereum. During this bull-run, Bitcoin’s developer community has a disagreement on how to grow the project and the coin splits into two, with the formation of a new asset called Bitcoin Cash (which today has further split into 2 more coins. Bad news involving new regulations on cryptocurrencies and outright bans in certain countries also plagues Bitcoin’s expansion. The price reaches an all-time high of $19,783 in December 2017. One year later, Bitcoin acceptance and usage increases. The development of the Lightning network brings scalability to the payment network. A 5th satellite is launched by Bitcoin software developer Blockstream, bringing Bitcoin satellite coverage to all continents except Antartica. On January 7th, the price is currently at $4077. If you look at the spreadsheet above, you’ll see that this is just 1 of 12 previous declines, and ranks 4th in severity, percentage wise. A new form of money is created and owned by no one. 10 years later, and the development community and 3rd party support are stronger than ever. The price remains extremely volatile. Enron is done. Bitcoin is not. Enron was a company. Bitcoin is a technology. If Enron was listed — it would need to increase by over 135,000% to reach it’s previous high. Bitcoin needs 385%, and has returned 1600%, 1504%, and 585% in previous declines. Enron lied while working under a regulatory framework. Bitcoin is completely open-source, transparent, and can fit into any regulatory framework we choose to put it in. Enron was controlled by people. Bitcoin is not controlled by anyone. The main difference is in motivation. Enron was run by people, who let greed guide their decision making and ended up defrauding investors for $74 billion. In Bitcoin, there is no one that profits. If we wanted to make believe that there is a person who is scheming behind this, wouldn’t they sell everything at the top like the insiders at Enron? The original Bitcoin wallet with over 1 million bitcoins remains today, untouched. The biggest Bitcoin miner, Bitmain, just laid off 80% of it’s workforce. There is no scheme, there is no fraud. It’s possible that the Bitcoin experiment will still fail, but comparing it to one of the largest bubbles in history is wrong. Feel free to add me on Linkedin here, follow my twitter there →@xldean, and send me a Telegram. New article ideas are always appreciated! Enron vs Bitcoin: War of the Bubbles was originally published in Hacker Noon on Medium, where people are continuing the conversation by highlighting and responding to this story.